NASA's two Voyager spacecraft, exploring different areas of the solar system more than two billion miles from Earth, have provided the most precise measurements yet of new species of cosmic ray particles, Voyager project scientist Dr. Edward Stone said. 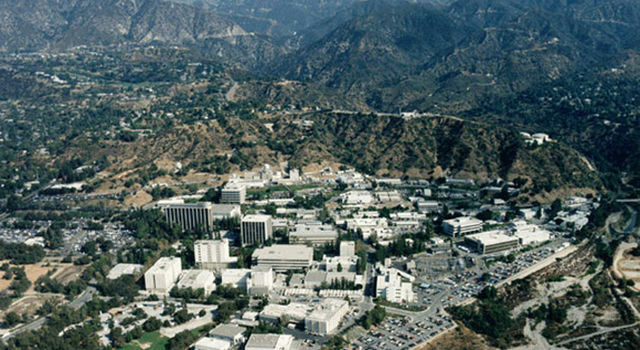 Dr. Alan Cummings, Caltech physicist who worked with Stone in studying the particles, presented the Voyager findings before recent meeting of the American Physical Society in Washington, D.C.
Voyager 1, after its 1980 encounter with Saturn, was sent upward from the ecliptic plane, the area in which Earth and most of the other planets orbit the sun. Voyager 2 encountered Uranus in January of 1986 and is headed toward Neptune. Cosmic ray instruments aboard both spacecraft have been used to determine the nature of particles entering the solar system from the local interstellar medium, said Stone, professor of physics and chairman of the division of Physics, Mathematics and Astronomy at Caltech. Cosmic ray particles are the nuclei of atoms moving at near the speed of light. Stone said the investigation offers the potential of independent measurements of the elemental composition of the local interstellar medium. During year-long study beginning in October, 1985, the Voyagers made the most accurate measurements of helium, hydrogen, nitrogen, oxygen and neon and began to see for the first time carbon and argon particles. He said the helium, nitrogen and oxygen particles were first discovered in 1973 by the Interplanetary Monitoring Platform (IMP) orbiting spacecraft and by Pioneer 10. The flow of neutral particles is called the "anomalous cosmic ray component," because carbon, so abundant in nature, was not observed. That initially was puzzle, he said, until it was realized the likely source of material was inflowing neutral interstellar gas in which carbon is relatively under-abundant because it is mostly ionized and is therefore deflected by the solar magnetic field. Some small part of carbon is neutral and the Voyagers have instruments sensitive enough to detect it and the neutral argon. As the neutral particles approach the sun, they become charged, or ionized, by losing an electron and are picked up by the outflowing solar wind and carried out to the edge of the solar wind's influence, called the heliopause. "Before the solar wind runs into the interstellar medium, there is shock which accelerates the particles to cosmic ray energies, or about 10 percent of the speed of light," he said. "They then flow back into the solar system at much higher speed, and that's when they are observed." The Voyager findings further confirmed the model for the origin of the anomalous cosmic ray component, Stone said, "but more importantly it is now possible to employ model to relate the cosmic ray observations to the abundance of elements in the interstellar gas." He said the discovery of carbon and argon was possible only because solar activity is at cyclical low and the particles are able to flow into the solar wind against less resistance than when the sun is fully active. The sun's activity will increase again in several years, he said. Stone said the interstellar particles, born in supernova explosion in some past time, drift into the solar wind at about 16 kilometers (10 miles) per second. But once ionized they are picked up by the solar wind and carried outward as charged particles at about 400 kilometers (250 miles) per second. Stone said the Voyagers are getting closer to the region of the shock where the particles are further accelerated to velocities of more than 30,000 kilometers (18,600 miles) per second, more than 10 percent of the speed of light. "There are some indications the shock may be about 10 years away for the Voyagers, and possibly sooner for Pioneer 10," he said. Voyagers 1 and 2 are moving at more than 30,000 mph relative to the sun. In about 20 years both spacecraft are expected to arrive at the heliopause, the region where the solar wind first makes contact with the interstellar medium. 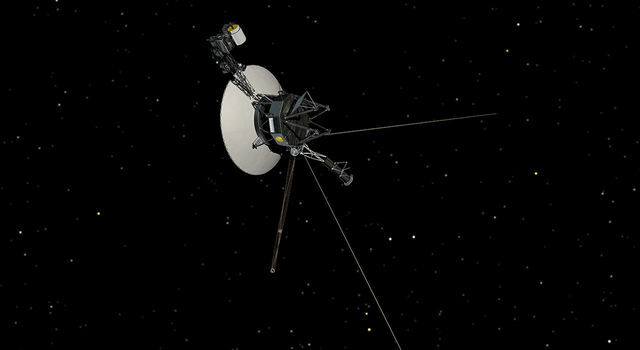 It is expected the Voyagers will still be operating at that time and will provide the first direct probing of the interstellar medium.